When you place a loved one in a nursing home, you expect that the nursing home will be able to provide the same or better care than you could provide. However, nursing home abuse is a huge problem. Often, homes are understaffed, or staff is poorly trained. In some cases, residents may be subject to physical abuse by staff. They may not be able to articulate it directly, or they may feel shame talking about it. If you have been subjected to physical abuse in a nursing home, or you suspect that a loved one has been harmed, the Chicago nursing home abuse attorneys at Moll Law Group are available to investigate the situation and help you pursue a claim for compensation. Billions of dollars have been recovered in cases in which we have been involved. Nursing home residents in Illinois have the right to be free from physical abuse. Their rights are enumerated in the Illinois Nursing Home Care Act, 210 ILCS 45. This law is enforced by the state Department of Public Health. Long-term care facilities are required to make sure that residents' rights under the law are protected. These rights include the right to be free from physical abuse or neglect, the right to private visits, the right to religious freedom, the right to retain personal property, and the right to a personal physician's care. If a nursing home violates one of these rights, such as by using physical abuse to restrain or control a resident, the owner of the nursing home may be held liable in a civil lawsuit. Who can bring this type of lawsuit based on a rights violation? Under the Nursing Home Care Act, either the victimized nursing home resident or his or her authorized representative can file a claim or suit. In some cases, a resident has dementia or developmental disabilities. This can make the case more challenging both to bring and to prove. Usually the resident can have a family member, friend, social worker, or other trusted person appointed as a legal guardian or authorized representative. In some cases, it may be necessary to have the court appoint a representative, with whom a nursing home abuse lawyer in Chicago can work in bringing a claim. Often, the perpetrators of physical abuse against a nursing home resident are fellow residents or staff members. An individual staff member or resident is not held responsible under the Nursing Home Care Act. Instead, this type of lawsuit is filed against the owner of a "long term care facility," under the rationale that the owner should hire qualified staff members and supervise them appropriately, and the owner should be responsible for what happens at the home. A long term care facility is defined as any place, whether or not it is operated for profit, that provides personal care or nursing for three or more people who are not related to the owner by blood or marriage. In some cases, identifying the owner can take time and investigation. The owner may be a corporation, or there may be different levels of ownership, and your lawyer may need to sort through paperwork and other materials to figure out the appropriate entity to hold responsible for the physical abuse. 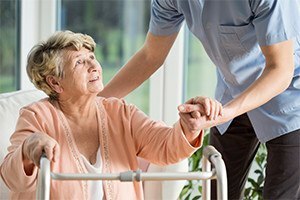 If you or your loved one's rights were violated by a nursing home staff member’s or fellow resident's physical abuse, the Chicago nursing home abuse lawyers at Moll Law Group can pursue a claim or sue the responsible entity on your behalf. Our injury attorneys also represent people in Naperville, Schaumburg, Wheaton, and communities throughout Cook County. Contact us via our online form or call us at 312-462-1700 to set up a free consultation.